When our group first began to discuss the direction we wanted our project to go in, we wanted to be sure that the project captured just how cool of a guy Bartram was. And indeed, he was a crazy guy. He traveled through wild country from Charleston up into West Virginia, meeting Indians, buffalo, and alligators along the way. So how do we capture that? 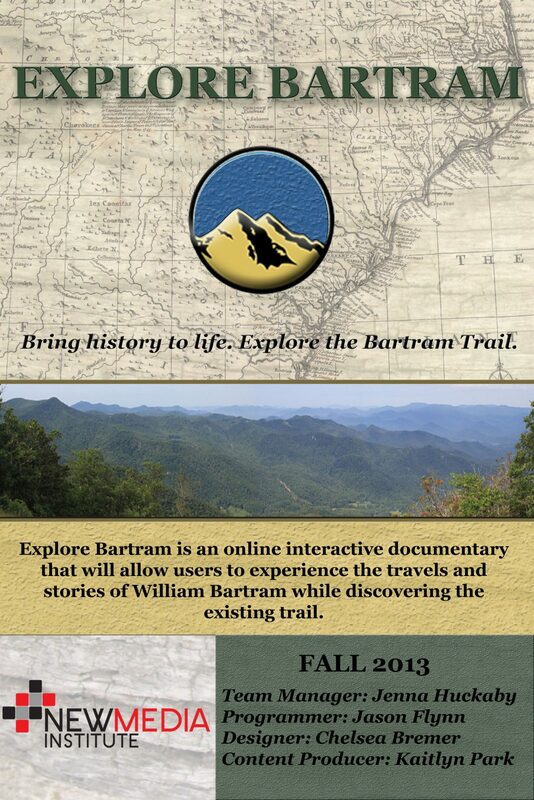 How do we engage people and make them interested in Bartram? When we first began, we weren’t exactly sure. Our inspiration was “Snow Fall”, the Pulitzer Prize winning journalism piece. We loved “Snow Fall”, but we wanted to go deeper. Our focus became clearer: to create an audio documentary which allowed users to create their own story through the work of Bartram, while also understanding how much the land has developed since he walked there. We wanted naturalists, mountain bikers, back packers, and outdoor enthusiasts to become aware of all the amazing things his trail has to offer and to create the desire to make stories of their own through the trail. In the past weeks, we have made some very exciting strides. We have begun by examining Bartram’s experiences in Athens. We took specific locations and developed a “focus” for the content for that location. At the Botanical Gardens, we are examining the flora and fauna Bartram illustrated in his works, and will be taking a tour of the gardens, where we will record our guide explaining the different plant life that are there now, and that were there when Bartram traveled there. At Whitehall Forest, we will be showing the research being done through the Forestry School and taking a tour through the facilities and trails there- embracing the naturalism of Bartram’s career and showing the work being done there now. For Dudley Park and Downtown we are focusing on the history and the development of the area since Bartram was there. We’ve even connected with mountain bikers who bike the trail regularly who are filming their experiences with a “Go Pro” attached to one of their helmets. Each area will unlock content such as trail guides, panoramic views, maps, quotes, illustrations, etc. while the audio documentary plays. Users choose which content they engage with to create their own story. We hope to move from Athens into Charleston and possibly North Carolina, creating content that captures the importance of the trail and Bartram himself.